99 Attributes of Allah: Al Noor - The Light of the Universe ~ Islam My Ultimate Decision . One of the 99 attributes of Allah is Al Noor " النور ". 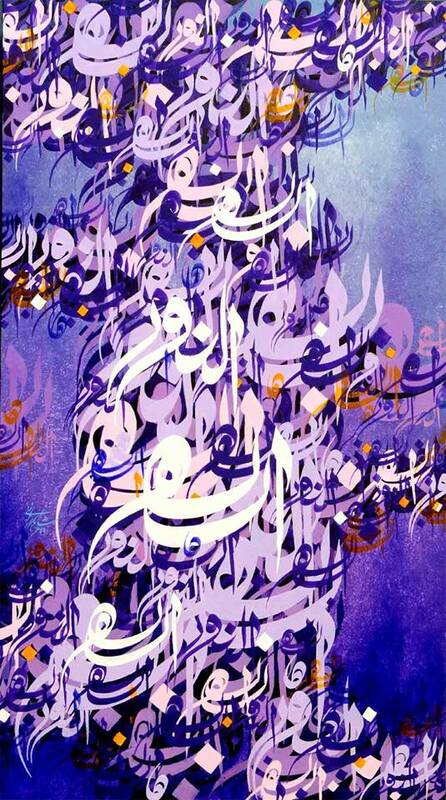 Ordinarily, noor / nūr is light, whatever its glow, rays, or reflection may be. It aids vision. But when it comes to describe as an attribute of Allah, its whole complexion changes for Allah is Noor not in the meaning of the Arabic word Noor, but far beyond. Allāh is the light of the heavens and the earth. A likeness of His light is as a pillar on which is a lamp - the lamp is in a glass, the glass is as it were a brightly shining star - lit from a blessed olive-tree, neither eastern nor western, the oil whereof gives light, though fire touch it not - light upon light. Allāh guides to His light whom He pleases. And Allāh sets forth parables for men, and Allāh is Knower of all things. Light is something which makes things visible; which is itself manifest and helps make other things manifest. The human mind conceives light in this very sense. Absence of light is termed darkness, invisibility and obscurity. On the other hand, when there is visibility and things become exposed to view, man says there is light. Thus Allah has been called Light' in this basic sense. This conception of light has nothing to do with the reality of the meaning for which human mind has coined this word; rather the word light is used for all those lights which we experience in this physical world. All human words used for Allah are used in their basic sense and meaning, and not with reference to their physical connotation. For instance, when, the word sight is used with respect to Allah, it does not mean that Allah has an eye like men and animals with which He sees. Similarly when we say that Allah hears or grips or grasps, it does not mean that He hears through ears, or grips or grasps with the hand like us. These words are used in a metaphorical sense and only a man of very poor intelligence would have the misconception that hearing or seeing or grasping is not possible except in the limited and specific sense in which we experience it. Similarly it will be shortsightedness to interpret the word light in the sense of physical light rays emanating from a luminous body and affecting the retina. This word is not applicable to Allah in its limited sense, but in its absolute sense. That is, He alone in this universe is the real and prime cause of manifestation, otherwise there is nothing but darkness here. Everything which gives light and illuminates other things has received its light from Him; it has no light of its own. The word light is also used for knowledge, and ignorance is termed as darkness. Allah is the Light of the universe in this sense too, because the knowledge of reality and of right guidance can be obtained from Him alone; without having recourse to His Light, there will be nothing but darkness of ignorance and the resultant vice and wickedness in the world. In this parable, Allah has been likened to the Lamp and the universe to the Niche. The glass shade is the veil behind which Allah has concealed Himself from His creation. This veil is not a physical veil for concealment, but a veil caused by the intensity of divine manifestation. The human eye is unable to see Him not because of the intervening darkness but because of the intensity of the all pervading, all-embracing Light radiating through the transparent veil. The human vision which is limited in nature cannot comprehend it. It can only comprehend and perceive limited physical lights which vary in brightness, which disappear and reappear, and Which can be perceived only by contrast to existing darkness. But the Absolute Light has no confronting darkness. It does not vanish, it shines forth and pervades all around with ever existing glory; it is beyond human perception and comprehension. As for the lamp which is lit with the oil of a blessed olive tree, which is neither eastern nor western, this is a metaphor to give an idea of the perfect light of the lamp and its brilliance. In antiquity the source for brilliant light were the olive lamps, and the most superior oil for the purpose was that obtained from a tree standing in an open and elevated place. The epithet of Lamp for Allah in the parable does trot mean that Allah is deriving His energy from some external source. It only means that the Lamp of the parable is not an ordinary lamp but the most brilliant lamp that can be imagined. Just as a brilliant lamp illuminates the whole house, so has Allah illuminated the whole universe. Again, the words “its oil is (so fine) as if it were going to shine forth by itself though no fire touched it”, are also meant to emphasize the brilliance of the light of the lamp, which is being fed by the finest and most readily combustible oil. The olive and its being neither eastern nor western, and high combustibility of its oil by itself' (without fire), are not the essential elements of the parable, but attributes of the lamp, which is the primary element of the parable. The essential elements of the parable are only three: the Lamp, the Niche and the transparent Glass Shade. The sentence: His light may be likened, dispels the possible misunderstanding that one could have from the words: Allah is the light of the heavens and the earth. This shows that the use of the word light for Allah does not at all mean that the essence of His Being is nothing but light. In essence, He is a Perfect Being, Who is All-Knowing, All- Powerful, All-Wise etc. and also possessing all Light has been called Light itself because of His Perfection as a source of Light, just as somebody may be called Grace on account of his being highly gracious and beneficent and Beauty because of his being highly beautiful and attractive. That is, although Allah’s Light is illuminating the whole world, everybody does not and cannot perceive it. It is Allah alone Who blesses whomsoever He wills with the capacity for perceiving His Light and benefiting by it. Just as the day and night are alike to a blind man, so is the case of a man without the gift of inner perception. He may see the electric light, the sunlight, the moonlight and the light from stars, but he cannot perceive the Light of Allah. For him there is nothing but darkness in the universe. Just as a blind man cannot see the stone in his way unless he stumbles over it, so is the man without the gift of inner perception, who cannot perceive even those realities around him which may he all brilliance and shining by Allah’s Light. He will perceive them only when he is overtaken by the consequences of his own misdeeds. This means two things: First, He knows what parable can best explain a certain reality, and secondly, He knows who is entitled to receive this bounty and who is not. Allah has no need to show His Light to the one who has do desire or longing for it and who is utterly lost in worldly pursuits and in seeking material pleasures and gains. This bounty can be bestowed only on the one who in the knowledge of Allah has a sincere desire for it. The Messenger and Prophet of Allah is quoted to have been supplicating to Allah in the morning saying, "Lord! I invoke You to create light in my heart, light in all parts of my body, light in my hearing, light in my sight, light in my hair, light in my complexion, light in my flesh, light in my blood, light in my bones, light before me, light behind me, light on my right, light on my left, light above me, light underneath me! Lord! I implore You to increase my light, to grant me light, and to create light for me." The Persian scholar Al-Zamakhshari (c. 1074 –1144) interprets Nūr or Light as: "Allah is the light of the heavens and the earth" as meaning, He is the possessor of the light of the heavens and the owner of the light of the heavens. The light of the heavens and the earth is the truth (al-ḥaqq), which can be compared to light in its manifestation and clarification, just as he says, "Allah is the friend of those who believe; He brings them forth from the shadows to the light (Surah Al Baqarah 2:257), i.e., from the false to the true (al-ḥaqq). To sum up, Al-Noor illuminates the hearts of the truthful through His Unity, and the conscience of those who love Him by His support for them. He beautifies the complexions and brings life to the souls of the pious through their adoration. He guides the hearts to prefer and opt for what is right, Who guides the innermost conscience to silently address Him. May Allah help us and guide us to understand Him better by understanding many of His attributes and His commandments contained in the Holy Qur'an brought through His last of the Prophets, Muhammad (peace be upon him).